During the Battle of Vienna, Count Ernst Rüdiger von Starhemberg was outnumbered 5 to 1 against a sea of Turkish soldiers, led by the swarthy Kara Mustafa. Ever since Constantinople fell to the Ottoman Turks in 1453 they became the relentless terror of Christendom. For centuries, the nations of Europe fought the Turks on land and at sea. There were great battles and victories and temporary peace treaties. At other times internal political instability among both Europeans and Turks diverted their efforts elsewhere. Nevertheless the struggle between Islam and Christendom continued and the initiative remained with the Turks so that, by 1683, they controlled most of Hungary with only the upper portion remaining part of the Holy Roman Empire (HRE), synonymous with the House of Hapsburg and Austria. Although there was currently peace between the HRE and the Turks, conditions seemed favorable for Sultan Mehmed IV to renew the war. Rebellious Hungarian nobles, angered by Imperial persecutions of Protestants, threatened the Empire’s sway over upper Hungary and were ready to side with the Ottomans. In addition, France, the Hapsburg rival for European hegemony, urged the Sultan to go to war with the HRE. Thus encouraged, Mehmed demanded outrageous tribute and territorial concessions from Hapsburg Emperor Leopold I. Negotiations broke down and the Second (Great) Turkish War of 1683-1699 had begun. Sultan Mehmed opted for a limited strategy that would strengthen the Ottoman frontier and support the Hungarians. The latter had already overrun most of Imperial Hungary in 1682. To ensure the security of their new ally, a vast army of Turks and provincial levies was assembled at Constantinople. Mehmed himself did not bother to lead his army, preferring to go on one of his lavish hunting trips. Command was instead handed to the Grand Vizier, the swarthy Kara Mustafa. Mustafa was to aid the Hungarian insurgents by conquering the Imperial strongholds of Györ and Komarno. Reinforced by the horsemen of the Crimean Tartar Khan, Mustafa possessed 160,000 troops. To oppose Mustafa and his allies, Emperor Leopold could muster a mere 32,000 soldiers. The large size of his host and his boundless ambition induced Mustafa to disregard the Sultan’s orders. Against the advice of his commanders, he left only token forces to invest Györ and Komarno and marched straight for Vienna. On July 14th Mustafa appeared before the city walls. To Mustafa’s chagrin, he found Vienna’s defender, Count Ernst Rüdiger von Starhemberg, prepared and determined to withstand a siege. Together with Duke Charles of Lorraine, Count Starhemberg razed the suburbs to the ground to deprive the attackers of cover, hastily repaired the once-debilitated walls, and brought in ample supplies from the countryside. Lorraine further reinforced Starhemberg’s garrison with 8,000 infantry and a burger militia was quickly assembled and trained. In addition to the 11 infantry regiments, militia, 400 artillery pieces and two lines of moats and walls with 12 bastions protected the city and its 60,000 remaining citizens. At the time Vienna’s population consisted mostly of peasants who had drifted into the city from the countryside. For them Vienna would be the only chance of escaping the Turkish wrath. Others were not so lucky. Clouds of smoke rose from villages devastated by Turkish troops and their cold-blooded Tartar allies. In the village of Pectholdsdorf alone, more than 3,000 of the men were butchered and the women and children dragged into slavery. In contrast to the peasants and soldiers, Vienna’s upper class followed their Emperor’s example and fled the city to seek safety in the west. From the towers of St. Stephens, Starhemberg beheld a sea of thousands of multicolored Turkish tents drawn up in crescent moon formation southwest of the city. They included Mustafa’s opulent pavilion with his hundreds of concubines and slaves, exotic animals, and even a fountain erected by his engineers. Farther to the west and north stretched the Kahlenberg heights. Beyond that formidable wilderness, Charles of Lorraine had taken his remaining 10,000 cavalry to harass Tartar raiding parties, confront Hungarian rebels at Pressburg, and assemble the anticipated relief army in the Tulln valley. Starhemberg did not know when that relief army would come or if it would be large enough to defeat Mustafa’s army. What he did know was that Vienna’s walls must hold against the Turkish onslaught until help arrived, or else the streets would run red with Christian blood. The Turks used throngs of Hungarian slaves to build siege works while their artillery pounded the walls. For his part, Starhemberg launched sorties to interrupt the Turks whenever possible. Fortunately for the Viennese, in his haste to reach the city, Mustafa had abandoned his cumbersome bigger guns. With his light calibers unable to reduce the city walls, Mustafa was forced to take the city using mines and assaults. Masters in siege mining, the Turks tunneled like moles toward the city’s defenses. The Christian engineers in turn countermined while above them their comrades defended against the fanatic assaults of the janissaries. The earth shuddered from explosions and cannonballs pelted against the walls. 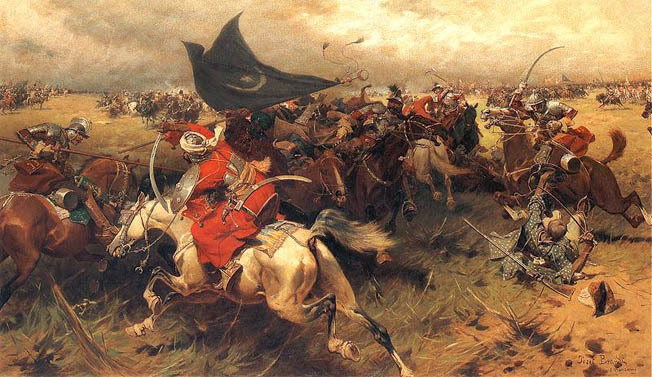 Turkish arrows rained upon the defenders and Christian musket fire ripped through the ranks of charging janissaries accompanied by the deafening blare of Turkish military bands. From behind battlements the Austrians swung halberds to tear through the armor, flesh, and bone of Turks who scaled the walls. No quarter was given or asked to the “hereditary” enemy. Both sides quickly lapsed into terror tactics; the Turks butchering peasants in front of the walls, the Austrians flaying captured Turks alive to mount their heads on pikes. The Grand Vizier directed the main attacks against the Hofburg (Imperial Castle), defended by fortifications called the Burgbastei (the Castle Bastion). Although this was the most heavily fortified area of the city, its higher ground prevented underground water from interfering with mining operations. On August 12 a Turkish mine collapsed part of the earthworks. The explosion filled the moat with earth, forming a causeway that permitted a direct assault against the main walls. Turkish troops at once poured across but were beaten off with heavy casualties to both sides. Starhemberg could ill afford the losses; his garrison had already lost 1,200 men. At least the Turkish advances, though they reached ever closer to the inner defenses, were bleeding the janissaries white. Besides combat casualties, disease spread its ugly hand over both armies as heaps of rotting corpses, filth, and bodily waste and the hot August weather provided a perfect breeding ground for dysentery and other maladies. By the end of August most of the Burgbastei’s outer defenses lay in ruins. On September 4 the Turks nearly penetrated into the city through a 30-foot breach in the outer wall but were thrown back by an Austrian countercharge led by Starhemberg himself. During the night, Starhemberg lit the first distress rockets from the towers of St. Stephens. To the Turks the rockets foreshadowed imminent victory. In premature celebration they broke into the suburban Viennese wine cellars and set upon a drinking binge. For the next three days Mustafa drove his troops hard to break into the city but was denied victory through the almost superhuman efforts of the Austrian garrison. Reports that a relief army was drawing near filtered into the Ottoman camp. Although Mustafa would not admit it to himself, his situation had become desperate. Fully 30,000 of his men had died beneath Vienna’s walls and most of them were elite janissaries. His army was still vast but their spirits were sagging while his large Tartar and Romanian contingents would be of doubtful value against a disciplined Christian army just as they had been next to useless in assaults on the city. Ibrahim Pasha and 13,500 reinforcements were on their way from Györ but no help could be expected from the Hungarian rebels. The latter had been driven from Pressburg by Charles of Lorraine and now refused to come to Mustafa’s aid. On the 7th and then again on the 11th, fires and flares leaped up from the Kahlenberg heights. The relief army had arrived. Tags artillery, Battle of Vienna, cannon, Constantinople, Count Starhemberg, earthworks, Ernst Rüdiger von Starhemberg, Kara Mustafa, Militia, roman empire, Romania.